We are very pleased to announce that we have received funding from Innovation Centre WA to conduct biochar emission testing on our pyrolysis process. The biochar emissions testing is very important in the commercialisation of our technology and will provide invaluable feedback going forward. We are pleased to announce that our application to the Northern Agricultural Catchments Council (NACC) to run biochar trials has been successful. The primary aim of the biochar trials is to demonstrate potassium response to the application of wheat straw biochar to soil in a cereal crop. Energy Farmers Australia is pleased to announce the development of our first mobile biochar kiln. The kiln has been in the pipeline for well over a year and we have just finished construction. We are in the process of commissioning the unit and expect to have it operating in the the next couple of months. The Anaerobic digestion process or AD for short uses micro-organisms to break down organic materials in the absence of oxygen to produce biogas and bioenergy. The Grains Research and Development Corporation released a fact sheet in January 2013 titled Understanding Biochar. We are working with stakeholders to ramp up the bioenergy industry in Australia. Our view is that we need to build the confidence of farmers and feedstock suppliers in bioenergy technology, develop biomass supply chains and ultimately be in a position to supply large amounts of biomass to future bioenergy and biofuels projects across Australia. Bioenergy Roadmap – A good plan for the future. Internationally it has been proven that bioenergy can be a significant player in energy supply. Indeed many developed economies have ambitious plans to increase the contribution of bioenergy in future. Currently bioenergy contributes less that 1% of Australia’s energy supply. Australia must draw from these international experiences and apply them as part of actions required to combat the effects of climate change. “Carbon Tax” – opening up opportunities in Australian agriculture. In May, the Federal Government announced the successful applicants of “Filling the Research Gap” and “Action on the Ground“, round one funding, direct beneficiaries of the Clean Energy Futures policy. I think its great to see the variety of projects and it’s the first real step to getting farmers and the rest of Australia away from their reliance of fossil based products and toward more sustainable agricultural systems. 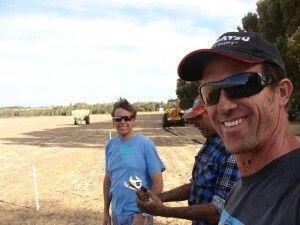 Biochar in the ground in Western Australia.